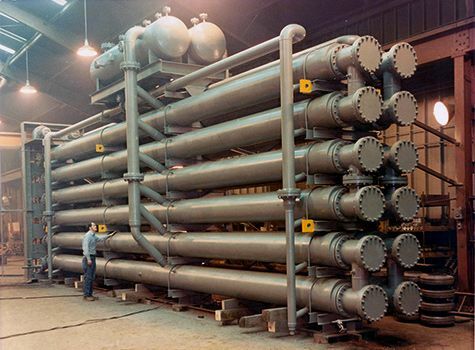 Armstrong Chemtec Scraped Surface Heat Exchangers are double pipe elements designed to cool a mixture in order to generate the production of Crystals through Continuous Cooling of the mixture. Cooled crystals preferentially adhere to the inner face of the inner pipe. When these crystals stick to the pipe wall, the heat transfer is inhibited. Because of this, the crystals must be continuously removed to allow others to grow and to allow the crystals to exit the heat exchanger as slurry, in solution. The slurry exits the heat exchanger and a percentage of the crystals will be taken downstream to a separation device. Such a device may be a centrifuge, a bowl centrifuge, a vacuum filter or any device which allows the crystals to be removed and processed. Most crystals will be formed from an Organic mixture but some soluble salts allow for the separation of crystals by cooling. Scraped surface heat exchangers are available from one element up to as many as are required to perform the cooling duty. Armstrong Engineering has process data for over 360 chemical mixtures and a history of 70 years using this process. Scraped Surface Continuous Cooling Crystallizers are up to 90% more energy efficient than using distillation columns.